Until you have the best weight bench, your home gym is not complete. You can’t do press, fly, curl, and more without a weight bench. The best weight bench will support you through your full lifting journey. You can easily use a workout bench with power racks, dumbbells, cages, and other attachments to facilitate entire body workout. Take a look at the top 10 list of the best weight bench below to see the best heavy duty incline and decline workout benches that you can buy for your home gym. Our recommendation for the best adjustable weight bench is The Bowflex SelectTech 5.1, it is just the one that will worth your investment. Here are the top 10 adjustable weight bench below. Choose the right workout bench for you that will support your workouts for a long time. If you are looking for a budget-friendly adjustable weight bench that gets the job done then check out this Bowflex 5.1 Stowable Bench. You will get 6 different adjustment angles. This heavy-duty adjustable bench has 600-pound load capacity. This best weight bench can be stored vertically when not in use. This Bowflex Stowable Bench is our favorite bench yet that comes with premium construction and amazing space saving feature. 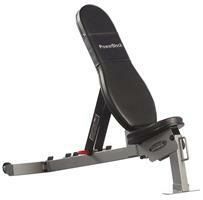 The Bowflex SelectTech 5.1 weight bench is a perfect choice that will make your workout much easier. It offers a full range of workouts. The main exciting feature that you will love is its six different positions, i.e. -17° decline, flat, 30°, 45°, 60° and the full 90° that allow ultimate exercise versatility and doing different workouts. When working out with the dumbbell, it offers a stable base and you do not need to worry about losing grip on the seat. This Bowflex SelectTech 5.1 adjustable weight bench offers different positions that will help you to not slip when working out. 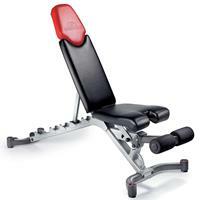 You can get the best position as the seat of this weight bench is nicely adjustable. It will ensure you maximum comfort and support when working out. This weight bench is easy to move around with its in-built wheels. It is designed with high-quality steel that makes it a heavy duty bench. This bench can take heavy weight people too. The parts of this bench are easy to assemble. And it takes less than 30 minutes to assemble. Another feature that we like is its stability and great balance. Bowflex 5.1 weight bench brand is easy to clean and wipe after working out. The Bowflex 5.1 weighs 56” by 26” by 20” (LxWxH) and weighs about 61.7lbs. You will get a one year warranty on the upholstery and 30-year warranty on the frame. A number of buyers received some misshapen parts. A few received parts that did not fit together properly. Editor’s Recommendation: Bowflex SelectTech 5.1 adjustable weight bench is a quality bench that minimizes the risk of injury and maximizes effectiveness. It is a better version than the Bowflex 4.1 and 3.1. It worth the money that you buy it. This Body Champ Olympic Weight Bench is built for the serious lifter. Anyone looking for both upper and lower body development from home, this awesome bench is an excellent choice. With included safety measures and all included accessories, you will be satisfied for sure on so many levels. Body Champ Bench helps to perform your workouts on a large multiple and variety flat, incline, and decline military positions. 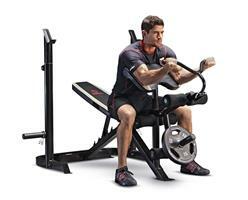 This Body Champ Olympic Weight Bench has the ability to adjust the backrest in 7 different positions. You can use this bench to a variety of ways. So that you can work on your pectoral muscles incredibly. Here you can find high-density padding preacher curl and crunch handle to perform ab crunches for a great core workout. The racks have safety hooks. The ‘U’-shaped front leg stabilizer. This will give you safety and stability during the workout. The major standout feature that you will love is the wide number of accessories that this bench offer. Though it doesn’t offer any barbells or weight plates, it comes with other important accessories that can be utilized for your weight bench workouts. Spring Clip For Leg Developer. Ab Crunch with Foam Grip Handle Attachment. It is compatible with most 6’ and 7’ weight set bars. Note: There are many weight set bars available in the marketplace. The pinning for the incline/decline bench is harder than necessary. It is a bit tall to get a good footing on the ground during workouts. If you plan on rotating between bench press and squats, this will be time-consuming. Editor’s Recommendation: This Body Champ Olympic Weight Bench has adjustable dual – action leg developer with Adjustable Foam Rollers for Leg Curl/Leg Extension. Accessories that come with this bench are Olympic Plate Adapter, Preacher Curl Pad, Arm Curl Bar, Spring Clip for Leg Developer, and Ab Crunch. If you are looking to develop body strength and lean muscle mass while increasing your metabolic rate to burn calories, the Marcy MD-879 is your solution. The upright bar support can be used for squats and lunges. While the bench doubles stand-alone utility work for lower leg, abdominal and bicep exercises. It is one of the best adjustable weight benches with squat rack. This Best Olympic Bench has an Adjustable back pad for incline, decline, and flat chest press exercises. You can get a total leg workout from the Marcy diamond Olympic bench that comes with a squat rack. The built-in port on the machine organizes and stores weight plates. It also has an adjustable preacher curl pad with detachable bicep curl bar that allows extended bicep workouts. It is also the best weight bench with leg curl. 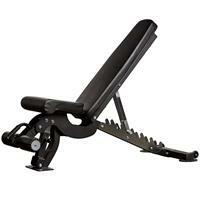 This training bench is great for a wide variety of full-body workouts. The Marcy Diamond Olympic Bench has an adjustable back pad and arm curl pad too. The separate squat rack can be used to perform walk-in squats and lunge exercises, giving you more flexibility in your training regimen. One customer said that he worries about the pegs that hold the weights on the rack because they are only held on by a single bolt. He can’t put too much weight on them for storage. Editor’s Recommendation: This all-in-one Marcy diamond Olympic weight bench set with a squat rack is an ideal choice for any level of users looking to build full body muscle. You can get the best position as the seat of this weight bench is nicely adjustable and ensure maximum comfort and support when working out. Those who have less budget for the weight bench, for them this Marcy weight bench is the perfect solution. It covers almost all the features that an expensive bench offers. Improve your home gym with the Marcy Flat Utility Weight Bench, and get ready for a more efficient bodybuilding routine. This weight bench lets you perform a range of exercises to target specific muscle groups in a compact space. You can easily do fat-burning and muscle-building workouts right in the comfort of your own home with this high-performing utility bench. This Marcy Flat Utility Weight Bench has a durable steel construction made of premium materials. Its heavy-duty steel tube frame is furnished with high-density foam and boxed upholstery, ensuring steady support maximizing your comfort while you exercise. This Marcy Flat Utility Weight Bench brand allows you to perform a full-body workout so you can build and tone your physique whatever you want. It is perfect for home exercise and you will get all the benefits of an intense gym session without leaving the house. Made of high-quality materials & a heavy-duty steel tube frame. This utility bench fits in your home without taking up too much space and maximizes mobility. This weight bench is great for home workouts but there are better benches with advanced feature. Editor’s Recommendation: The Marcy Flat Utility Weight Bench is created to suit your active lifestyle, this workout gear is the perfect addition to your home gym. This weight bench has a powder-coated finish for the resistance of heavy wear and tear. This weight bench is a great option and will take care of all your weight lifting needs. The sufficient load capacity makes it ideal for those who lift heavy weights in different positions and requires a strong and durable adjustable weight bench set. It is a versatile workout bench brand with many angles (from 0 ° to 85 °). Use a pedal to change position without leaning. Your seat has three different heights that you can use and is removable. People who already have this training bench accept that the unit is an absolute dream. Each piece is made to last a lifetime. Everything that will be necessary to it is already provided. Note that the seat follows the back so that it is always perpendicular to the back to prevent slipping when using the slope. Note that the seat follows the back so that it is always perpendicular to the back to prevent slipping when using the slope. It does not move or bend during use. This Ironmaster Supper Bench has a 10-year warranty. This includes the replacement or repair of mechanical integrity for home users only. Wear parts such as painted surfaces and rubber are not covered by the warranty. The seat has three different heights that you can use which is removable. Quickly adjust to 11 angles from decline to upright! Some customer complained that it is a horrible incline bench and the removable seat is way too wide. Editor’s Recommendation: With 11 different angles, this Ironmaster super bench will help you to address all upper body muscles. It is resistant to 60 pounds and keeps the weight you lift. Its design is unique, so you can easily add any attachment. In my opinion, this model is the best weight bench for beginners that you can have at home. This Best adjustable weight bench is robust and versatile. The seat cushion can be adjusted downwards in an inclined position so as not to slide forward when lifting it up. The dimensions are 50 L x 16 H x 21 W (in inches). You can easily perform bicep curls, dumbbell presses, shoulder press and leg lifts, which will give you maximum exercise. This strong weight bench has built-in wheels for easy mobility, facilitating the transition from one point to another. This best adjustable weight bench has an optional dip-top that is purchased separately. Power Block sports bench has separate seat and back cushions with cushioned tapered cushions to help you with a comfortable workout. It provides maximum comfort during training which is the key to reduce the risk of injury and encouraging training. This bench can be adjusted to five positions, including flat, military and different, with adjustment of 30, 45 and 60 degrees. It has a separate seat and back settings. 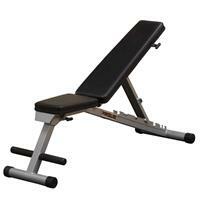 This top-rated weight bench is made of durable 14 gauge steel, highly stressed and therefore it is very robust. 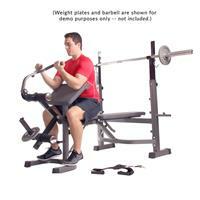 This best adjustable weight bench has an optional dip-top that is purchased separately. It has a very large space that can support a variety of body types. The seat cushion can be adjusted downwards in an inclined position so as not to slide forward when lifting it up. The dimensions are 50 L x 16 H x 21 W (in inches). A customer said that it wobbles too much. Another customer did not like the gap between the lower and upper seat. The shoulder cut out is too small. Editor’s Recommendation: This Power Block Sport Bench is an excellent brand for home fitness device because it does not require assembly. Just attach the lower back support bar, which should take less than five minutes! I recommend it to anyone looking for a strong and robust bank that requires a minimum of assembly. This foldable weight bench has seven adjustable positions to help a user perform various exercises. The flat bench, the inclined and sloping press, and the shoulder press can be made with different settings. Additional angles also provide more options for targeting different muscle groups at the top of the body. It can also be placed at different angles, making it easier to perform workouts such as triceps and curly extensions. Customer reviews: The reviews that this ‘best weight bench 2019’ has received are mostly positive. Most of them have praised the bank for offering great free weight exercises. In addition, it has folding wheels and gussets for the pawn function that can be increased many inches. This Body Solid Powerline bench is actually a great weight bench for beginners. It is difficult to criticize this weight bench brand for its shortcomings, mainly because of the price it needs. The weight bench is pre-assembled. The unit can also fold up. Bottom of the bench can be sticky, especially due to ripping off the stickers. It feels kinda gross. It would lean against the floor if you put it under your bed. This could scratch up the wall or floor when stored. Editor’s Recommendation: If you are a beginner and are trying to decide if you want to start weight training, you should consider using this device. If you already have training experience, consider another powerline bank that gives you more options. However, you can still buy it if it’s still a better option for you. Rep adjustable weight bench is ideal for use with handlebars with cage, power rack or Smith while working at different angles. Its best feature is that it can be set to 7 positions from -20 degrees to 85 degrees and the seat is set to 4 different angles to give more support when the rear corner changes. The seven positions are fixed on a bare steel ladder, which prevents the paint from peeling off and falling off the metal-to-metal contact. This awesome weight bench have roller skates that you can use to lock your legs while you train downhill. The wheels are coated with vinyl, which facilitates cleaning. Made of 11 “, 2” X2 “steel box that makes it durable enough to hold a lot of weight, up to 1,000 lbs. It is ideal for the home because it is light and easy to move because it has wheels on the back. It comes with a thick, sturdy 2.5 “seat wrapped in durable textured vinyl for maximum support and comfort. The cushion also measures 11.5 inches on the shoulders and sits between the backrest and the remote seat padding minimal. Measure 54x26x17.5 “so if you are small or tall, you will have your feet on the ground while you train. Has a 10-year manufacturer’s warranty on the frame and 30 days on the coating. The seat is wider. It is not a huge con but it could be a slimmer seat. If you’re under 5′ 6″, it’s a little high to keep feet flat on the ground when lifting in the flat or decline position. No rubber padding on feet. If you are using this on a hard surface it will slide. Editor’s Recommendation: It is one of the best adjustable weight for home gym. People who have purchased this Adjustable Bench, they say they are worth the investment they have made. Although this equipment is not cheap, it is worth buying it. Body Solid GFID225 provides a wide range of exercises, especially for the upper body. The best feature is that it has the required position, ie flat, inclined and inclined (FID), which is preferable when exercising. The decreasing position is the best work on the lower chest and helps to focus on the chest, shoulders, triceps and muscle endurance. This is the perfect training bench as GFID225 is functional, portable, compact and durable. If you do not have enough space at home, this is the best adjustable weight bench because it has a height of 9 inches when it is flat, making it easier to slide under a normal bed at an angle. The customer’s reviewed that GFID225 is totally worth the money, although it does not have the 90-degree position that it can not do some shoulder exercises. The material is very strong and of high quality, which makes this best adjustable weight bench easy to clean. In addition, it is not necessary to assemble because it was once removed from the packaging; GFID225 is ready to use. It has a lifetime warranty if used only at home but not for commercial purposes. The warranty covers all parts of the bank. 7 adjustment positions that will give you all the versatility you need while exercising. There are piles on the front for stability while working, and there are 2 3-inch oval tubes that provide support and durability for heavy workouts. This workout bench has wheels for quick and easy mobility and soil protection. The bench measures 57 x 16 x 18 (W x D x H) inches and weighs 54 pounds, which carry a maximum weight of 1000 pounds. Editor’s Recommendation: Buy this Body Solid GFID225 collapsible folding workbench if you need a sturdy device without extra bulky accessories. 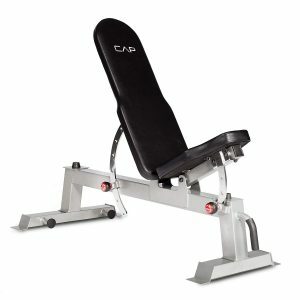 This Cap Barbell weight bench is sturdy and reliable. It offers a variety of features and positions to exercise your workout, especially your weightlifting program. It allows you to perform exercises and dumbbells of the upper and lower body to achieve your goals of muscle building and muscle retention. This powerful weight bench Includes 7 adjustable back supports and 3 seat adjustments for maximum support of the back of the lower body, upper body, and hull. The Cap Barbell weight bench is made up with a 12 and 14 gauge steel frame for stability and durability, powder coated and protects against rust and oxidation. This Cap Barbell weight bench is an excellent model for basic exercises like twists and crunches. 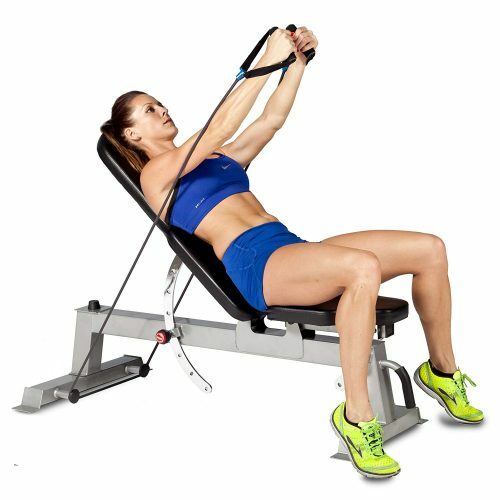 Again this Adjustable weight bench brand has anchorage points at the base of the frame that allows you to fix the resistance bands for the variety of your workout. It is a high-quality adjustable weight bench that has oversize pop handles to easily adjust the bank. The Seat and back cushions are finished in artificial leather with box seams for greater comfort and support. This workout bench is ideal for you if you’re looking for a soft color option for older users or rehabilitated users. One customer complained that he was unable to assemble due to weld misalignment and release pin of back angle adjustment. Editor’s Recommendation: If you’re looking for a budget-friendly weightlifter, then the CAP Barbell Deluxe utility desk is the right choice for you. Not only does it promise good training, but it is also very robust and has clear assembly instructions. There are two types of weight benches, such as supply units and racks with racks. The utility has no brackets, they are adjustable and are used with exercises with dumbbells. They are cheaper because they do not require much equipment and are not the best for large aircraft. Supported benches are best for heavy workouts for those who use rockers that provide greater stability for compound movement, and the brackets provide grip. The style you choose depends on your training. This is very important and you have to invest a lot in purchasing excellent construction equipment. It should be made of steel and thick pipes, usually made of a solid metal that does not rust and does not easily counterbalance. Check the manufacturer’s specifications to find out if the weight and weight of the user are within the load range. A good weight bench brand has at least one inch of lining to provide more comfort during training. Light padding on the side and lumbar pads make it uncomfortable during exercise and you could cause back pain. Check that the lining is sewn with a box stitch as this is the best point against wear. A small but good quality bank is good for a home gym instead of a huge expensive bank for the gym or commercial gyms. If you want to buy a weight bench set, it is important to choose one that suits you, so do not just put it in your house and do not use it. You must first understand clearly what type of bodybuilding program you will follow, what are your goals and what is your routine. This determines the type of equipment that best suits you and your weightlifting program. It should be quickly adapted to multiple locations without screwing or removing a needle. For a more effective workout, you can practice with the best models with a flat, sloped, and down-tilted angle, and with these angles, you can perform a variety of training exercises and target different muscles. There are 6 types of weight benches available on the market. These are the most popular and most common types of benches. Flat benches don’t have any attachments. Olympic benches are like professional and advanced level benches that are usually longer and wider. Olympic benches are not ordinary benches rather they come with additional equipment such as squat rack, weight plates, rod, dumbbells and more. Olympic Weight benches are a complete exercise machine that allows you to do some advance workouts such as squats, bench press, quad exercises, and more. An adjustable workout bench is more flexible and allows you to do different workouts easily by adjusting the bench accordingly. It can be inclined or declined or lie flat. If you need a exercise bench that can be folded easily and carried anywhere than you should go for Folding Weight Bench. But the problem is these folding benches are not designed with the rich feature as they have to fold. If you want to work the peak of your biceps then Preacher Curl Bench is good for you. It is made to do preacher curls especially. 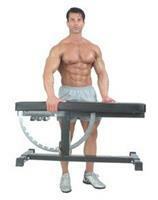 Abdominal Bench is introduced to do abdominal exercises or core workouts. You can set it according to incline, decline or flat position. It is a bench that is specifically made for performing ab exercises. The position of these benches can be either flat, incline or decline. These Abdominal benches have foot rollers in order to lock the feet and better protection of the exerciser. This practical guide of 6 basic exercises will help you to build entire body muscle easily using a weights bench. The bench press with dumbbells helps to build your chest muscles and work on your pecs differently if you cannot lift as much as with a barbell. This bench press with dumbbells exercise will give better range and a more natural movement. You will need: weights bench, 2 dumbbells. Main targeted muscles: shoulders, pectorals, triceps. Performing the exercise: lie on your workout bench, then slightly arch your back and try to put your feet flat on the ground. After that, you need to take a dumbbell in each hand. Bring the dumbbells together and stretch your arms out vertically. From this position pull your shoulders back and contract your pectoral muscles. Then lower the dumbbells down slowly to each side of your chest. After that contract your pecs and press (push) the dumbbells back up without bouncing back, bringing them together as they reach the top. Safety instructions: your shoulders, head, and buttocks must remain resting against the bench. Without this stability, there is no strength. They help to anchor you. Keep your elbows in line with your shoulders, when you bring the dumbbells down. You will need: weights bench, dumbbell. Main targeted muscles: build your chest muscles, long head of the triceps, pectoralis major, latissimus dorsi, teres major. Performing the exercise: First, lay down on your bench. Then pick up a dumbbell with both hands and above your head extend your arms. Take a deep breath and then lower the dumbbell behind your head, with your elbows slightly bent. Breathe out when returning to your starting position. Safety tips: Your shoulders, head, and buttocks must remain resting against the bench. This incline press exercise with dumbbells also helps to build your chest muscles and allows a more comprehensive natural movement than with a barbell. This incline press exercise is very useful to rebalance your pectoral muscles, as it focuses more on the upper part. 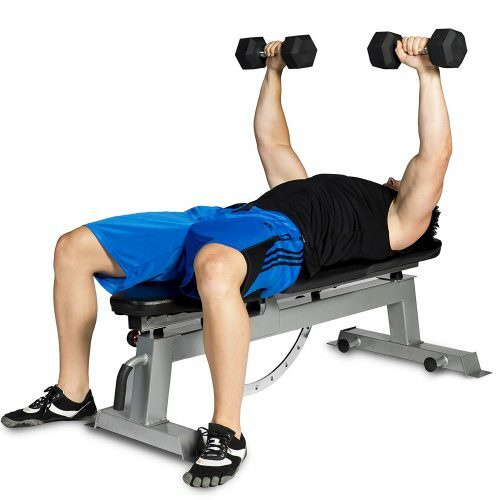 Performing the exercise: At first, lie on your adjustable weights bench, inclined between 15° to 45°. Then slightly arch your back and you must put your feet flat on the ground. Taking a dumbbell in each hand, stretch your arms out vertically bringing the dumbbells together. At this position, lower the dumbbells down slowly to each side of your chest. Then contract your pecs and press the dumbbells back up without bouncing back bringing them together at the top. Safety tips: Your shoulders, head, and buttocks must remain resting against the bench. They will help to anchor you. When you bring the dumbbells down keep your elbows in line with your shoulders. Do not lock your elbows otherwise, it can damage the elbow joint. Main targeted muscles: To build up your backs, latissimus dorsi, teres major, posterior deltoid (back of shoulder), brachioradialis (supinator longus). Performing the exercise: All you need to do is stand up next to your weights bench and put one knee on the bench leaving your other foot on the ground. Steady yourself against the bench with one hand and take a dumbbell in the other hand. Contract your back then bring your elbow back, as high as you can go, to raise the dumbbell. Safety tips: Keep your back flat during the workout to protect your lower back. With each rep set try to lift the dumbbell without making any jerky movements. Main targeted muscles: This LYING TRICEPS EXTENSION workout especially works on building triceps. Performing the exercise: You need to lie on your workout bench with your feet flat on the ground. Then hold the bar with a supinated (palms facing your face) or pronated grip (easier for beginners), with your hands shoulder-width apart. Without locking your elbows, bend your forearm to bring the bar above your forehead and then extend your forearms to raise the bar above your head. Safety tips: carefully lower the bar by bending your forearms. And do not spread your elbows apart when lowering the bar towards your forehead. You will need: a workout bench and dumbbell. Main targeted muscles: Helps to build up biceps brachii, brachialis (located under the biceps). Performing the exercise: You just need to sit down on your adjustable workout bench with your legs apart and your feet flat on the ground. With a supinated grip pick up a dumbbell with your right hand and lean forward slightly. Place it on your right thigh and rest your other hand on your left thigh. After that take a deep breath and start lifting the dumbbell up to your chest. After that breathe out when returning to starting position. Safety tips: Always lift the weight without moving your legs or upper body. These weight benches with uncomplicated maintenance and excellent workmanship are generally used for doing exercises frequently to enhance your health. Choose the right weight bench that suits your need and your exercises.